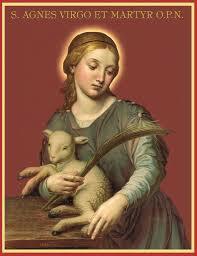 Saint Agnes was a Roman Catholic child martyr who was beheaded in the year 304 A.D. for refusing to marry. The eve of her feast day is an ideal time for Witches to perform all forms of romantic enchantments, especially love divination. According to a very old legend, it is on this night of the year when an unmarried woman is able to catch a glimpse of her husband-to-be in a dream. the face of my true love to be. with a kiss this rhyme is sealed. Place a kiss upon the mirror's glass and then place the mirror with the glass side up, underneath your pillow. In your own words give thanks to Saint Agnes for listening to your prayer, and then go to sleep with an open mind. If there is a marriage in your future within the next twelve months, you should receive a vivid dream about the partner in matrimony.